A few weeks ago, Eating in Translation tweeted that Johnny Air Mart would start having roast pig on Fridays. The following Friday I was there, immediately after work. Unfortunately, they had grilled pork skewers but roast pig was nowhere to be found. It turns out Johnny Air Mart has lechón (roast suckling pig) every other Saturday (starting at 11:10am) and I just missed it the previous Saturday. I would have to wait another week. The next weekend, as soon as I woke up, I put on my clothes and told Alvin (David’s cousin who was visiting from out-of-town) that I was going out for roast pig. Having stayed with us before, he didn’t seem surprised. Shortly after, I returned with half a pound of lechón ($13.99/lb.) and we dug in. The meat was insanely tender, slightly sticky, and moist. People who complain that pork is tough never had lechón. Flavor-wise, it was subtle, but far from bland. The man carving up the little piggy made a point of telling me the pigs are always cooked over charcoal, never in the oven. According to him, if a pig is roasted in the oven, only the outside ends up tasting good. Not sure if this was the reason why, but the meat was indeed porkalicious throughout. Served on the side was a tangy lechón sauce for dipping. Although made of liver, it wasn’t very heavy and cut the richness of the pork. I was told the sauce is good with anything greasy and/or fried. However, the best part about the lechón was the sweet crackly pieces of amber skin. It was like pork candy. Next time I’ll be buying a full pound just for the extra skin. I also bought a few other goodies to try out. 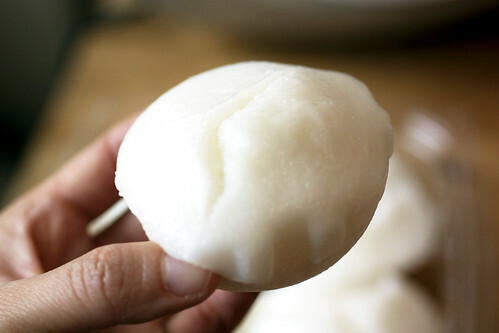 Puto, a squishy steamed rice cake, looked similar to my favorite Korean rice cake made with alcohol (jeung pyun, 증편), but was more bready without the sour alcoholic taste. I wanted the chicken empanadas ($1 each) to be good, but unfortunately, the one I got was dry and crumbly, inside and out. In contrast, the turrón ($2.50 for 3), far from disappointed. 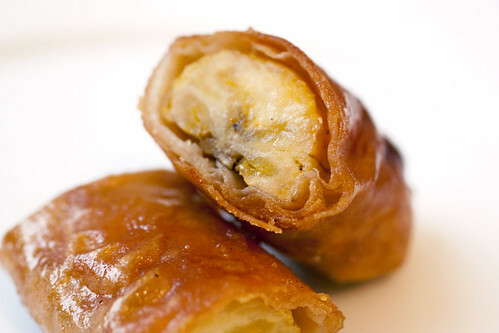 It’s a spring roll stuffed with a halved plantain (referred to as a banana at the store, but is actually made with a plantain), coated with sugar, and fried. Caramelized sugar on anything fried never hurts, especially crunchy plantain spring rolls. I’m currently quite obsessed with these little guys. So far I’ve gotten them two weeks in a row, and each time they were so good I tried feeding them to the people around me. I like to share the deliciousness. So far no success. David doesn’t like anything remotely banana-like, and Alvin seemed genuinely scared by my freakish turrón excitement. Lechón will be available again next week. Get there early. They sell out in a few hours. But if you like to sleep in, don’t fret my fellow lazy bastards. On a recent turrón run, I found out you can reserve a pound of lechón if you let them know in advance. Sometimes it pays to be a freak. On a somewhat related tidbit, when you wrote that you wanted the chicken empanada to taste good, it made me think about how often I go to a restaurant because of someone’s suggestion, and how I’d try to find even the slightest aspect that was positive. It’s just kind of amusing to me that more times than not, it’s hard to be completely objective (or even true to your own opinion) because of something you’ve already heard. Maybe that’s not what you meant and I’m over analyzing haha. @Nicholas – One day you must eat one! And I wanted it to taste good because I love empanadas but haven’t found a good place that makes them. I’ve made good ones at home a few times, but sometimes you don’t want to cook. Any empanada recs out there? Wow, you really are obsessed with those bananas!!! I didn’t realize that was a liver sauce, though. Surprisingly light. 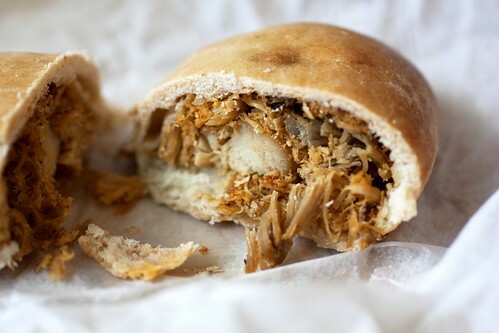 If you want the best empanadas I’ve ever had, meet us in Menorca this weekend. Washed down with an endless supply of pomadas, of course. Havana Central in Time Square has $1 empanadas every tuesday happy hour. I always pass by after work, but never tried it. @alvin – Next time you come, you will eat the bananas! As for Menorca, I don’t remember eating one empanada there. Why were you hiding them for me? @someguy – Yeah I heard about the empanadas at Havana Central. Although I’m tempted, after work I like to get the hell out of midtown. I know what you mean. After work it is like a rat maze getting to the train station! If the midtown Havana Central is the same as the UWS one… then they’re a steal for $1. They’re pretty damn good :). It’s traditionally a plantain, not a banana. @Melis – Yes, the ones sold at Johnny are made with plantains, but people who work at the store refer to the innards as bananas. Filipino people seem to use banana and plantain interchangeably. I made a note above. 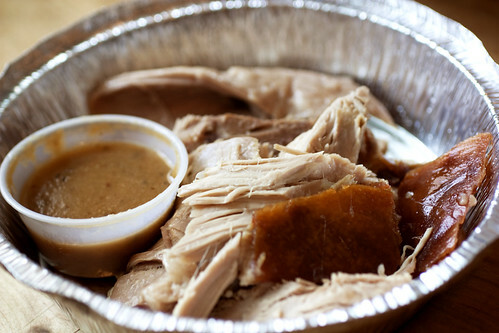 i’ve been meaning to try johnny air mart, i had no idea they also had lechon! now i really need to go..